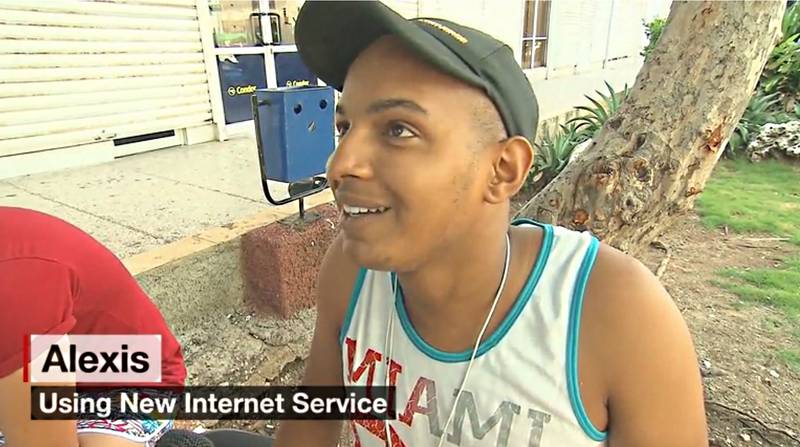 In July 2015, a CNN News post described the then new WiFi hotspots in Havana. The post included a two-minute video clip that centered around an interview of Alexi, a university student who used the hotspot to speak with his mother in Italy. He says it is uncomfortable and expensive, but hopes it will be cheaper in the future and his "dream" is to have Internet connectivity at home. CNN just published a new post on the WiFi hotspots, which also features interviews of WiFi users. They too are speaking with family members and their complaints are similar toAlexi's -- it is expensive, unreliable, uncomfortable and there is no privacy. In fact, the new post includes the old video of Alexi without mentioning that it was a year and a half old -- it fits right in. After complaining, one woman concludes "But we're learning to adapt." She is resigned. Alexi's dream is a little closer to coming true than it was in 2015. The access price is 25 percent lower and a home-connectivity trial is underway, if Internet service becomes available at his home and he can afford it, it will be much slower and more expensive than in other nations. Both videos point out that Cuba is one of the least connected nations in the world. The hotspots are better than nothing, but they are a drop in the bucket. The Cuban Internet is marginally better than when the hotspots opened in the summer of 2015, but the gap between Cuba and the rest of the world has widened significantly during that time. The same video is shown in both post.